Africa and to Southern Africa to find a better farming life. With the help of some of his workers, Angus built a mud hut for his family to live in. Angus was converted to Christianity by being invited to a church service by a friend. At the church, the pastor asked anyone who wanted to receive Christ to step forward, so Angus stepped forward with his family. Angus went on to be known as christian farmer. He prayed to God to raise a servant girl after she was struck by lightning. During a potential forest fire, he prayed for rain to put out the fire, even though it wasn’t rain season. A storm immediately came, quenching the flames and saving some of the few trees in the area. The man told Angus his dream, and they were both greatly relieved. Also during a drought, Angus gathered all the farmers together at the huge stadium and prayed for rain. 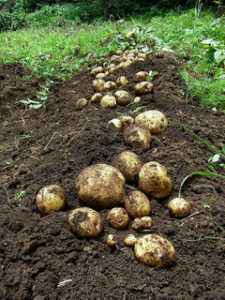 Angus also challenged the farmers to plant potatoes, because potatoes can only grow with plenty of rain. No farmer planted potatoes but Angus. I don’t know if there was much rain or not, but I do know that the potatoes turned out huge! Angus had also started an orphanage, and he told the orphans and his own children that they should have “Faith Like Potatoes.” That means that you can have faith in something near impossible.